This month we are going to take a short get away to the Downtown Phoenix area for the 2015 Inspired Soles art show. Do you love art, fashion, and a good cause? Then this event is for you. On April 2nd, the 6th Avenue Gallery will be showcasing the work of over 70 local artists and designers who have volunteered their time to transform a basic black stiletto into an amazing piece of art. This two day event will be held downtown at one of my favorite buildings, the Luhrs Tower, on Jefferson Street. 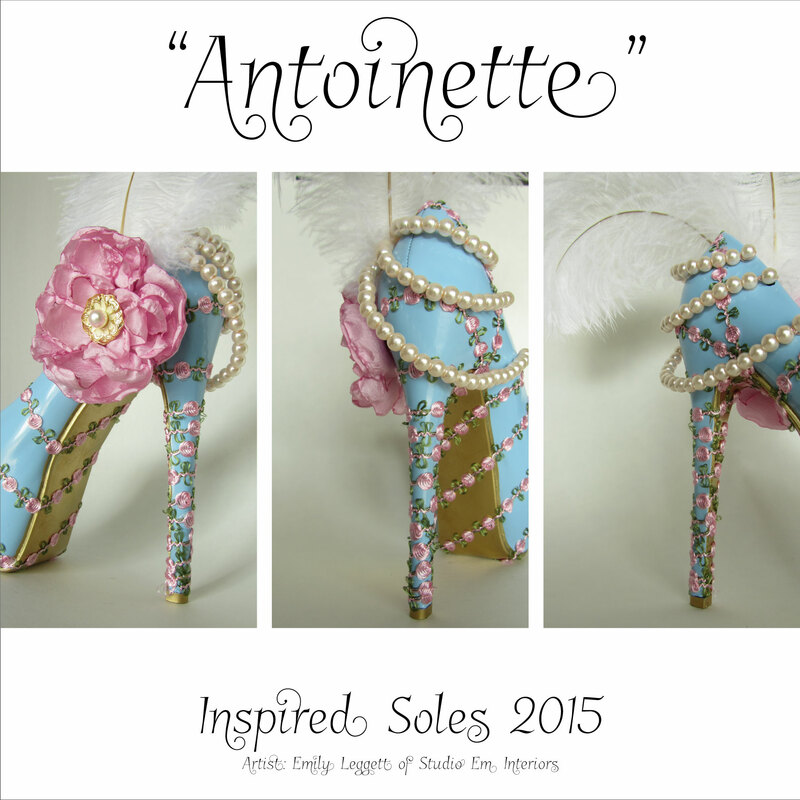 I was thrilled to be able to participate this year and have created my own shoe for the event entitled “Antoinette” (sneak preview of my shoe is pictured here on this post). Want to know the best part? If you see a shoe you love, you can take it home with you. All you have to do is be the highest bidder and it is all yours. The money earned from the silent auction benefits Artlink Phoenix, a non-profit organization that is focused on promoting the arts community in central Phoenix. They are dedicated to connecting artist, businesses and the public to promote and grow the arts scene in Phoenix. You can check out the 6th Avenue Gallery Facebook page for some sneak peeks of what you will see at the even this week. You can also check out the event page for more information. Think you want to attend? Here is what you need to know. What: Be some of the first to see the incredible transformation of all the stilettos and pick one to take home with you. Bids for all the shoes will start at $30 and increase by a minimum of $5 with each bid. Bid the highest and the shoe is yours! Come out and support a great cause and meet some new people. Refreshments and appetizers will be served. What: The shoes will all remain on display for everyone to come see as part of the First Friday festivities in Downtown Phoenix. The bidding will be over (so if you want a shoe come on Thursday), but everything will still be on display for you to see.